Following up on Jillian’s excellent post and our No. 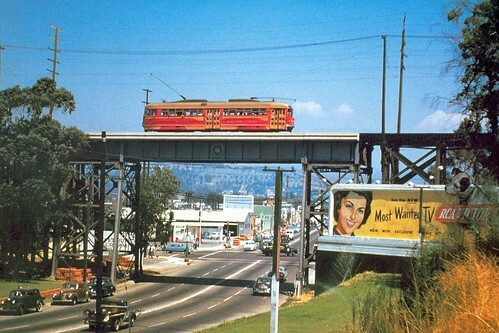 1 L.A. Legend about what did or didn’t do in our fabled streetcar system, on Atwater Village Newbie’s Flickr photostream is posted this stupendously awesome photo by transporation photographer Donald Duke of a Red Car train on the bridge that used to cross over Fletcher Drive near Riverside in Silver Lake. From the RCA Victor “Most Wanted TV” billboard I’d rather uneducatedly guess this is from sometime in the early-mid 1950s, but the cars seem older than that. Nowadays, with many of the bridge footings still in place I’ve long only been able to imagine what this place might have looked like back then. Not anymore. Photo is courtesy the Metro Transportation Library and Archive Collection. And FYI, a 2,000-pixel-wide version is available when you visit AVN’s Flickr page and click the “all sizes” button). Thanks for posting this. That’s almost our back yard! Wow awesome pic. My father used to ride the trains and he would tell me how easy it was to get around LA back then! Previous PostPrevious What’s An Antonym For Devine?